This bay was called ‘Koshizu’ at the time of the Fudoki and was written using different characters from those seen in the Forty-two Bay woodblock prints where it was referred to as ‘Koizu’. A final transition led to the characters in the currently used name. 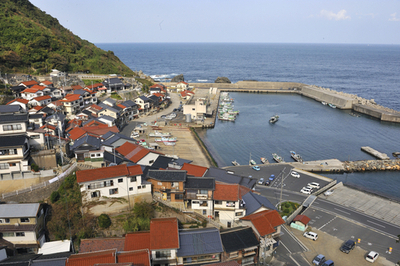 The guardian deity of Koizu, Sanja-jinja is enshrined neatly in the center of the town. The three kami of ‘Sanja’ are Uwatsutsuno-o-kami, Nakatsutsuno-o-kami and Sokotsutsuno-o-kami. In addition, according to the Unyoushi, ‘A certain person says that Mizu jinja appears in the Fudoki’. That person is Kishizaki Tokiteru, and for sure , a ‘Mizu-yashiro’ can be seen in the Tatenui article of the Fudoki. However, this ‘Mizu-yashiro’ is now enshrined in Mizutani, Honjo-cho so the comments on it raise some doubts .Future examination of both this and Mitsu-ura is needed to ascertain the full facts. Head East of the Koizu Tunnel on the No. 23 Prefectural Road. Come off in the direction of the seashore and take the narrow road on the right, looking down towards the village and the sea on the left side, one will find Sanja-jinja. If you keep going down to the end of the shore and then continue to the left, you’ll connect to the shore of Mitsu-town. Along with Uppurui, Mitsushima is mentioned in the Fudoki in connection with its famous seaweed .Seaweed thrives most when the sea is rough and choppy like a scene from a movie but the cobalt blue color seen when the waves push up to the rock face is quite a spectacle indeed. 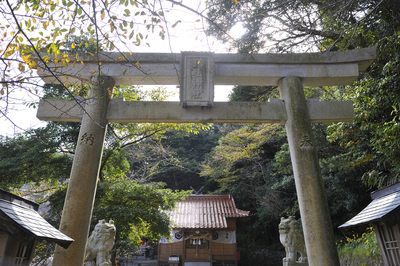 There is an Inari shrine near to the entrance of Sanja-jinja, compared to usual Inari, it takes up quite a wide area, possibly because of the depth of the Inari faith here. Koizu’s New Year event, the Tondo starts in the evening of January 3rd with a musical troupe of pipes and drums accompanying the patrol going through the town performing cleansing rituals. Here, a junior high or high school student, assuming the role of the kami, face half covered dressed all in white with a red cloth wrapped around the waist is employed as the ‘leader’. In the evening, the elementary and junior high school children’s kabuki begins, in the Prayer Hall of the shrine where the kami Toshitokujin is worshipped, musical performances and traditional rituals go on till around midnight. It’s said that during the traditional ‘waiting for the sun’ (all-night worship/neighborhood fellowship event) A Buddhist sutra is given at the prayer hall by the head priest.